Considering offering customer support through a messaging app like Messenger or WhatsApp? Wondering where to start? Unlike the decision to adopt a new social media platform, which might require a lot of careful considerations about your tour and activity company’s strengths, your choice of messaging platform should put one consideration above all: location, location, location. WhatsApp is the messenger app of choice for over 100 countries worldwide, including most of Europe, South America, and Africa, and the second most-popular messaging app in all of North America, too. It’s one of the biggest apps in the world. If you’re going to pick just one messaging platform to support, WhatsApp will get you the broadest global coverage. Earlier this year, WhatsApp Business launched on Android and the web in a number of countries. While companies had already been using the service to connect with their customers, the business-specific app offers a number of advantages, including business profiles, analytics, automated messages and account verification. While it’s likely that WhatsApp Business will eventually roll out to more of the world and arrive on iOS, you can also connect with customers on the standard app if you’re willing to go without those advanced features. If most of your customers come from the U.S., Canada or Australia, Facebook Messenger is the way to go. It’s the most popular messaging app in 64 countries, including those major markets, and it’s tied to a service you probably already know well. Facebook owns both Messenger and WhatsApp, giving it near-total market dominance. If you want to reach your customers through messaging apps, it’s likely that you’ll be using one of the company’s products. Fortunately, Messenger for Business is a well-established service that builds off existing Pages for Business, so it’s incredibly easy to get started. If you have a Facebook page, you probably have customers reaching out through it already. If you have a large customer base in China, WeChat is a platform worth considering. With nearly a billion monthly active users, it’s a social media juggernaut. It’s also one of the few ways a company can connect with Chinese customers, as global messaging services like WhatsApp and Messenger are blocked by the China’s digital firewall. Unfortunately, WeChat isn’t widely available outside China. Businesses based in the United States, Hong Kong, India, Indonesia, Macau, Malaysia, South Africa, Taiwan, and Thailand connect with the tenth of WeChat users who are outside mainland China. If you want to reach the rest, you need an official account registered with WeChat’s Mainland China-Market Platform, and that requires a business presence in China. Some Chinese businesses work with companies outside the country to provide WeChat accounts, but that isn’t an officially sanctioned practice. Most companies can safely ignore LINE. If you do a lot of business in Japan, Thailand or Indonesia, however, it might be worth your time. According to SimilarWeb, not only is it installed on over 80 percent of Android devices in Japan, it’s also used for about 45 minutes a day by average users. That’s huge! Like other messaging platforms, LINE offers a business platform (called LINE@) that allows real-time chat, broadcasts to followers, and advertising opportunities. While they lack the popularity of higher-profile apps, a few other messaging platforms are making a dent in the global market. Viber is popular in Ukraine, Belarus, Ethiopia, and a few other nations, and is Russia’s second choice after WhatsApp. KakaoTalk is huge in South Korea. And in Central Asia, a number of countries favor imo. In addition to those national top picks, there are some outlying apps that still pull in huge numbers of users. 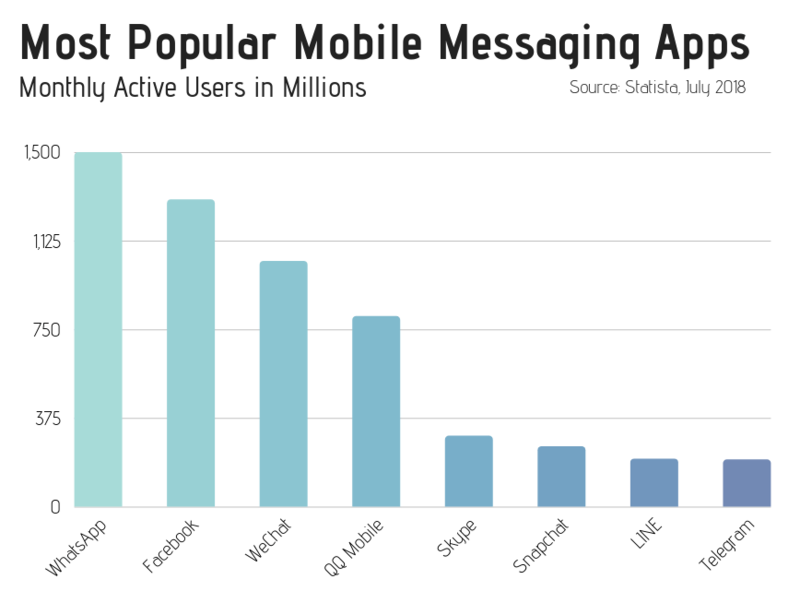 China’s mobile messaging market is big enough that QQ Mobile, its second most popular messaging app, is still in the top 5 globally for monthly active users. Telegram has high rate of monthly usage with over 200 million active users, but struggles with bans in nations that want to tightly control communications. And while it’s not the top pick of any individual nation, Microsoft’s Skype still maintains a decent global market share of around 300 million users. Using Rezgo’s reporting features, it’s easy to learn which markets matter most to your tour and activity business. With that information in hand, you just need to pick the best messenger for the job so you can start being where your customers need you most.